Examples, solutions, videos and lessons to help Grade 5 students learn how to multiply decimal fractions with tenths by multi-digit whole numbers using place value understanding to record partial products. 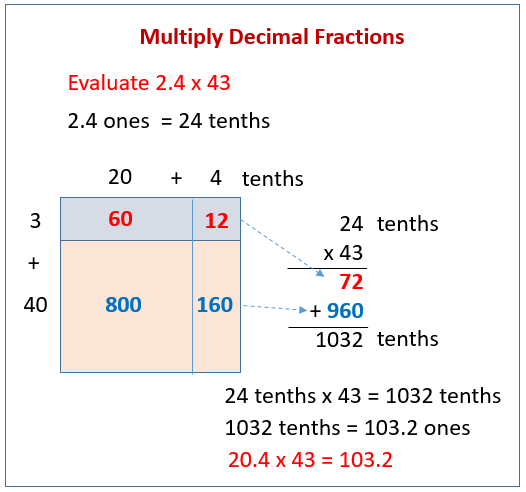 The following figures give an example on how to multiply decimal fractions with tenths using area model and partial products. Scroll down the page for more examples and solutions. 1. Estimate the product. Solve using an area model and the standard algorithm. Remember to express your products in standard form. 4. Rachel runs 3.2 miles each week day and 1.5 miles each day of the weekend. How many miles will she have run in 6 weeks? This video shows how to use area models to multiply decimals fractions with tenths by double digit whole numbers. Each problem is also solved using a standard algorithm. 2. Estimate, and then use the standard algorithm to solve. Express your products in standard form. 3. Mr. Jansen is building an ice rink in his backyard that will measure 8.4 meters by 22 meters. What is the area of the rink?